January 2, 2013 (San Diego’s East County ) – By a 257-167 vote late last night, the House of Representatives approved without changes a “fiscal cliff” deal previously passed by the Senate 89-8. The stock market reaction to ending the uncertainty was positive, rising 235 points or 1.9% on January 1 for a second-straight day of triple digit gains. It’s a deal that reflects compromise on both sides, averting a potential crisis short-term, but deferring major decisions on spending cuts and raising the nation's debt ceiling down the road. As the vote counting countinues, the margins in two hotly contested East County races have narrowed, while just three votes separate candidates in another local race. Two high profile contests, however, are now resolved. November 7, 2012 (San Diego)—Congressman Brian Bilbray’s slim lead has evaporated in the 52nd Congressional District. With over 95% of the vote now counted, Democrat Scott Peters has edged into the lead--first by just 13 votes, and now by 311 votes. Brian Bilbray addressed the press around 10:30 last night, thanking his supporters for knocking on doors, calling voters and walking precincts. This was a very hard campaign for the Congressman in the newly redrawn 52nd District, where the once-strong Republican majority is now razor-thin. Democrats have targeted this race nationally, hoping to unseat the incumbent Congressman who has been the brunt of ads critical of his ties to special interests. October 9, 2012 (San Diego) -- The National Committee to Protect Social Security and Medicare (NCPSSM), one of the most trusted, independent and effective advocates for these programs in the country since 1982, has endorsed Scott Peters for Congress, the Peters campaign announced today. NCPSSM President and Chief Executive Officer Max Richtman said they are endorsing Peters over Bilbray because they trust Peters to protect Medicare and Social Security, while Bilbray has voted repeatedly to cut these critical programs which protect many of America’s seniors from living in poverty. CONGRESSMAN BILBRAY ACCUSED OF BEING "SLUMLORD"
September 22, 2012 (San Diego) – A local organization is accusing Congressman Brian Bilbray of being a “slum lord.” The independent expenditure group, Much Better Choices, has filmed a video revealing numerous apparent building code violations. Fox 5 aired the video on Sept. 21. The video shows old boats, gas cans, a trash-littered weedy lot, and a dilapidated trailer with a growth resembling mold or fungus around windows--all on an unfenced lot adjacent to a school. Neighbors confirm the allegations and have said that they hope to see fines levied and the mess cleaned up. Read more about CONGRESSMAN BILBRAY ACCUSED OF BEING "SLUMLORD"
September 1, 2012 (San Diego) – Yesterday, entrenched incumbent Brian Bilbray, who has refused several debate requests, challenged Scott Peters to debates that Peters' campaign says they agreed to weeks ago. August 27, 2012 (San Diego)—Democrat Scott Peters’ Congressional campaign has issued a press release blasting his opponent, Republican Brian Bilbray, for a record on women’s rights and choice that “closely mirrors Mr. Akin’s,” Peters’ communications director MaryAnn Pintar said. 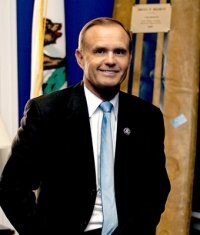 May 2, 2012 (San Diego) – In the hotly contested 52nd Congressional district, incumbent Brian Bilbray is weathering attacks from opponents on both sides of the political aisle for his votes on women’s issues. With the Supreme Court just one vote away from overturning Roe vs.
May 2, 2012 (San Diego)—Lori Saldaña and Scott Peters, two Democrats vying for Republican Brian Bilbray’s seat in Congress, picked up some key endorsements this week. April 1, 2012 (San Diego’s East County) – House Republicans this week passed a budget that would give massive tax breaks to the wealthy and to corporations, while weakening programs that benefit students, the middle class and senior citizens, including Medicare. October 15, 2011 (San Diego’s East County) – The Republican-controlled House this week passed a restrictive measure that would let hospitals refuse to provide an abortion even if urgently needed to save a woman’s life. Local Republicans Duncan Hunter, Brian Bilbray, and Darrell Issa voted for the bill, H.R. 358, while San Diegio Democrats Bob Filner and Susan Davis voted against it. June 29, 2011 (San Diego) – A Gallup Poll shows 72% of Americans support President Barack Obama’s plan announced last week to withdraw thousands of U.S. troops from Afghanistan this year. Just 23% opposed the troop drawdown plan, and some want to see an even faster troop withdrawal. Congressman Duncan Hunter (R-El Cajon), a veteran of the Afghanistan and Iraq Wars and member of the House Armed Services Committee, visited Afghanistan this week and met with General David Petraeus. He has voiced support for troop withdrawals, citing erosion of public support. But he called for a shift in focus toward counter-terrorism utilizing special operations forces, intelligence gathering capability and air assets. June 7, 2011 (Washington D.C.)—By a 268-145 vote, the House of Representatives rebuked President Barack Obama for not seeking Congressional authorization for military conflict in Libya. House Resolution 292, authored by Speaker John Boehner (R-Ohio) asked the President to provide Congress with justification for U.S. involvement in NATO-led military strikes. May 31, 2011- Women’s rights are under siege as Republicans in control of the House of Representatives recently passed H.R. 3. The No Taxpayer Funding for Abortion Act would sharply restrict access to abortion. March 26, 2011 (San Diego)--Did you miss the proposed trillion dollar government giveaway last week to big corporations? No, that is not a typo, a trillion not a billion, and yes, a Congressman proposed just that. Representative Brian Bilbray of San Diego, a former lobbyist, proposed a bill that would allow US corporations to dodge taxes on a trillion dollars in profits. Forget the debate over the estate tax or a tax break for the super rich; this proposed giveaway has them all beat, hands down!